Wash Rajma, chana dall and udad dal together with plane water. Add cumin seeds after washing them and soak them in 2 cups of warm water. Close the container with lid and leave it to soak for 1 hour. Whenever you soak grains, it will be better to soak them in lukewarm water so that grains will absorb water earlier and you need not wait for a longer time for complete soaking and at the same time, the batter will become soft and puffy. Wash and clean green chillies. You can replace green chilly with red chilly. You will have to soak red chilly along with rajma. 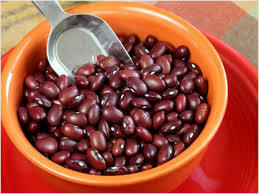 After one hour, drain water from soaked rajma in a bowl. You can use this water for grinding it or else you can use it for cooking other dishes, this water contains some important nutritional values of the grams, which are good for health. Pour the soaked ingredients in to a mixer jar. Add hing, green chillies and salt to it. Grind it for 1 or 2 minutes without adding water. Open the lid of jar, toss the paste with the help of a spoon and grind it coarsely. It may take 2-3 minutes. The paste should be thick. Do not add water ,if necessary, add a very little quantity of water and grind it again, otherwise take out the paste to a bowl. If you want, you can use garlic instead of hing ( asafoetida ) and you can add up onion as well. If you want to add onion, you have to chop it into very small pieces and add it to the grounded stuff and mix it well so that onion pieces should spread all over the stuff uniformly. Heat a kadhai (frying pan) on medium flame. Pour oil into it and wait for 5 minutes or until it becomes hot. Take the paste in hands, make slightly flat balls with the help of fingers and slowly drop them in oil. Deep fry them until they get golden brown colour. You can fry 6-8 vadas at a time. Take out vadas from oil and put them on a tissue paper so that extra oil will be absorbed by paper. While frying, you will have to turn the vadas upside down with the help of frying ladle. Repeat the procedure for remaining stuff. Now, hot, spicy and tasty Rajma vadas (fritters) are ready to serve.